Supercell thunderstorms, many producing tornadoes and some of which could be long-track, are lining up over western and central AR at the time of this writing (8:15pm). The graphics above show the upgraded risk area as of 8:00pm tonight. Much of AR has been raised to a High Risk of severe weather with long-track significant tornadoes a distinct threat. A Tornado Watch is in effect until 2am Saturday for these areas. Surrounding the High Risk, including extreme eastern AR up to the Mississippi River (including West Memphis and counties bordering the river), a Moderate Risk of severe weather has been posted as supercells are likely to track into eastern Arkansas later tonight with the possibility of tornadoes. A large portion of west Tennessee and all of northwest Mississippi, including the TN/MS portions of the metro region, are included in a Slight Risk for severe weather as storms could bring large hail, damaging wind gusts, and the possibility of a tornado overnight. Graphics showing the outlook areas, as well as the probabilities of tornadoes, large hail, and damaging wind, are shown above. 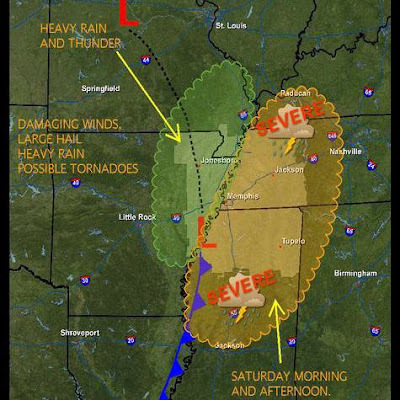 Stay with MemphisWeather.net for the latest on this developing weather scenario. Our newest addition - the MWN Storm Center - has the latest severe weather outlooks, county-by-county warning information, and updated radar for the Mid-South and maintains the latest information 24x7. Get the latest severe weather conditions and much more by checking out MemphisWeather.net on Facebook and Twitter! Cloudy skies will give way to a few peeks of sun this afternoon as wind continues gusting out of the south at 20-30 mph, humidity increases, and temperatures top out near 80 (especially if a little sun can come out). I expect scattered thunderstorms to begin breaking out after 3-4 pm and last into the evening. Many places may stay dry, some will see brief heavy rain, cloud-to-ground lightning, and perhaps hail or a high wind gust. Music Fest has about a 40% chance of thunderstorms and temps in the 70s throughout the evening. Storms should die down some after sunset, but scattered showers could linger. Late tonight (after 3am or so), a round of thunderstorms is possible again. The metro area is under a SLIGHT RISK of severe weather. Lows will be near 70 thanks to gusty south wind and cloud cover. Showers and thunderstorms are likely pretty much all day and into the evening as a cold front moves into the region. Some storms could be severe in the afternoon and evening, bringing large hail, dangerous lightning, high wind, and the isolated threat of a tornado. Rainfall could be heavy at times, with the possibility of a couple of inches in some places. A Flash Flood Watch is in effect for the entire region and we are under a SLIGHT RISK of severe weather. The high should be near 80 and humidity will be high. Outside of storms, wind will continue to be very gusty from the south. The cold front moves through very slowly, bringing drenching rains and the threat of more thunderstorms, though the severe risk is slightly lower. Some high wind gusts are still possible. Torrential rainfall appears to be the biggest threat with a few more inches of rain likely, especially after midnight Saturday night through the morning hours Sunday. Once again, temps in the 70s are expected Saturday evening, dropping into the upper 60s to near 70 by Sunday morning. A Flash Flood Watch and SLIGHT RISK of severe weather continue. A Flash Flood Watch continues though heavy rain should begin slowing up Sunday afternoon with scattered showers continuing into the evening. The heavy rain threat shifts south and east to north Mississippi and eastern portions of west Tennessee. By Sunday evening, much of the area could see rainfall totals for the weekend of 4-8' with isolated higher amounts. Sunday will see high temperatures in the 70s and much less wind behind the cold front. Music Fest-goers should see improving weather by evening, however the damage will likely already be done as another year of Memphis in Mud wraps up! The all-new MWN Storm Center is also now live, bringing you all the severe weather information you need in a one-stop shopping format. Click the link above to check it out! Sign up for severe weather alerts by e-mail, or get them on Twitter! More information can be found on the Weather Alerts Notification System page. THE COMBINATION OF DEEP GULF MOISTURE... INSTABILITY... STRONG WIND SHEAR... UPPER LEVEL LOW PRESSURE DISTURBANCES... AND A STALLED FRONT WILL LEAD TO SEVERAL OPPORTUNITIES FOR SEVERE THUNDERSTORMS... HEAVY RAIN... AND FLOODING FRIDAY THROUGH EARLY NEXT WEEK ACROSS THE ENTIRE MID-SOUTH. THE FIRST ROUND OF SHOWERS AND THUNDERSTORMS WILL MOVE INTO THE AREA FRIDAY AFTERNOON AND NIGHT. THIS MAY BRING SEVERE THUNDERSTORMS TO THE AREA WITH DAMAGING WINDS... LARGE HAIL... AND POSSIBLY TORNADOES. AREAS WEST OF INTERSTATE 55 /EASTERN ARKANSAS AND NORTHWEST MISSISSIPPI/ MAY HAVE THE BEST CHANCE FOR SEVERE STORMS DURING THIS TIME FRAME. IN ADDITION... VERY HEAVY RAINFALL OF 1 TO 3 INCHES OR LOCALLY MORE ARE POSSIBLE ACROSS THE ENTIRE AREA... WHICH MAY CAUSE FLASH FLOODING. ADDITIONAL SHOWERS AND THUNDERSTORMS CAN BE EXPECTED SATURDAY INTO SATURDAY NIGHT AS ANOTHER LOW PRESSURE DISTURBANCE AFFECTS THE AREA. VERY HEAVY RAINFALL AND FLOODING APPEAR TO BE THE BIGGEST HAZARDS WITH WIDESPREAD 1 TO 3 INCHES OR MORE OF ADDITIONAL RAINFALL. SEVERE THUNDERSTORMS MAY BE POSSIBLE AS WELL DURING THIS TIME FRAME... MAINLY SOUTH OF INTERSTATE 40 /SOUTHWEST TENNESSEE AND NORTH MISSISSIPPI/. SUNDAY INTO EARLY NEXT WEEK... SHOWERS AND THUNDERSTORMS MAY LINGER OVER THE AREA... PARTICULARLY OVER NORTH MISSISSIPPI... WITH HEAVY RAINFALL AND FLOODING EXPECTED TO BE THE MAIN CONCERN. TOTAL AVERAGE RAINFALL AMOUNTS ACROSS THE AREA ARE EXPECTED TO BE BETWEEN 3 TO 6 INCHES BETWEEN FRIDAY AND MONDAY MORNING... BUT LOCALIZED AREAS MAY EXPERIENCE MUCH HIGHER AMOUNTS. FLASH FLOOD WATCHES WILL LIKELY BE NEEDED. RESIDENTS OF THE MID-SOUTH SHOULD PREPARE FOR POSSIBLE SEVERE WEATHER AND INCREASING FLOODING POTENTIAL. STAY ABREAST OF THE LATEST FORECASTS AND STATEMENTS REGARDING THIS POSSIBLY DANGEROUS WEATHER SITUATION. IF YOU DO NOT HAVE A WEATHER RADIO... THIS IS A GOOD TIME TO PURCHASE ONE. IN ADDITION... YOU SHOULD REVIEW SEVERE WEATHER AND FLASH FLOOD SAFETY RULES... KNOW THE DIFFERENCE BETWEEN A WATCH AND A WARNING... AND BE READY TO PUT YOUR SAFETY PLANS INTO ACTION SHOULD SEVERE WEATHER AND FLOODING THREATEN YOUR AREA. As posted yesterday, the weather conditions are not looking pleasant for the Memphis in May kickoff and Beale Street Music Festival. Well over 100,000 people are expected to attend the annual Music Fest and the threat of severe weather appears to be increasing. The graphics above show the severe weather threat as highlighted by the Storm Prediction Center for Friday/Friday night in the top image and Saturday in the bottom. For Friday and Friday night, Memphis is right on the edge of a 30% probability of severe weather within 25 miles of any point (say, for example, Tom Lee Park...) and a 10% or greater probability of "significant" severe weather within 25 miles of that point. On Saturday, the day 4 outlook places us squarely in the middle of a 30%+ probability of severe weather within 25 miles of any point. What this boils down to is this: many of the necessary ingredients for severe weather are coming together and there is a chance that we will see large hail, damaging winds, and possibly isolated tornadoes in the region. In addition, due to well-above-normal moisture content of the atmosphere, the threat of very heavy rain and flash flooding is also a definite possibility. Please take all of this into consideration as you plan your outdoor activities this weekend, especially Friday afternoon through Saturday, and have a game plan should severe weather strike. Part of that game plan might include having severe weather watches and warnings delivered to you when they are issued! Sign up for MWN's FREE Weather Alerts notification system! You can get weather alerts delivered by e-mail for any of 6 metro counties, or if you are on Twitter, sign up for Shelby County weather alerts at @shelbyalerts. Of course, you can also keep up with the latest forecast, radar, warnings, etc. with MemphisWeather.net on the web and MWN Mobile (http://pda.MemphisWeather.net) while you are away from your PC. Get the latest severe weather updates and much more by checking out MemphisWeather.net on Facebook and Twitter (@memphisweather1)! Since it's almost May, that must mean it's time for Memphis in May! And you don't have to be a rocket scientist (or a seasoned meteorologist) to know that if it's Beale Street Music Fest weekend, it's probably going to rain. For all those that have come to expect a "Puddle of Mudd" (and we don't mean the band) at Tom Lee Park, 2010 likely won't disappoint! Unfortunately, after a respite from the severe weather conditions of last weekend, another potent springtime weather system looks to be taking shape for this weekend, and perhaps ALL weekend! High pressure during the mid-week timeframe will give way to a large trough of low pressure that will move towards the Birthplace of the Blues and Home of Rock and Roll by week's end. Abundant Gulf moisture will stream into the Bluff City on strong southerly wind Thursday and Friday, setting the stage (not the Sam's Town or Cellular South ones) for thunderstorms to break out sometime Friday, most likely by afternoon. Though computer models are still muddling through exactly how the weekend will play out, we have yet to see one that indicates dry conditions any day during the 3-day festival. It could be a very wet, perhaps stormy, Music Fest! But don't let that cause "Widespread Panic," just be prepared to get wet and have a great time! We'll keep a close eye on it and post updates via this blog, Twitter, and Facebook throughout the week. For a complete forecast for the upcoming week, updated twice daily, visit MemphisWeather.net. 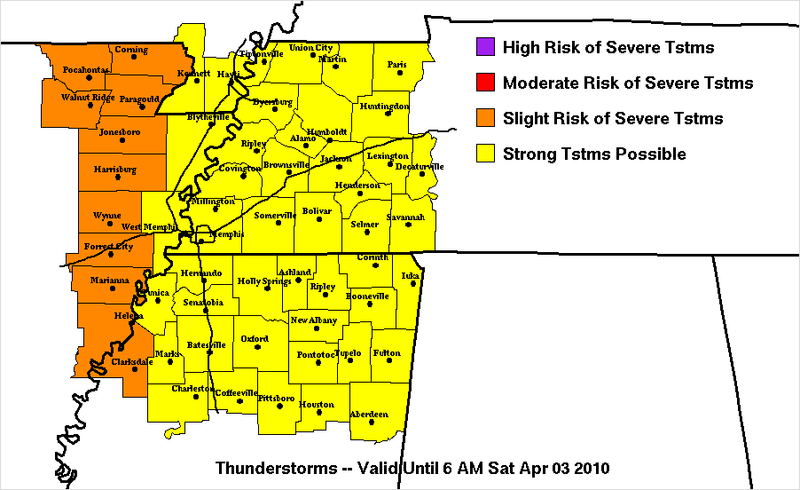 A day of violent weather across the Lower Mississippi and Tennessee Valleys, including the Mid-South, brought many reports of tornadoes, high wind, and large hail on Saturday, April 24, 2010. This followed an afternoon and evening of severe, but not as intense, storms the previous day. Locally, the National Weather Service in Memphis issued dozens of severe thunderstorm warnings, several tornado warnings, and several flash flood warnings. 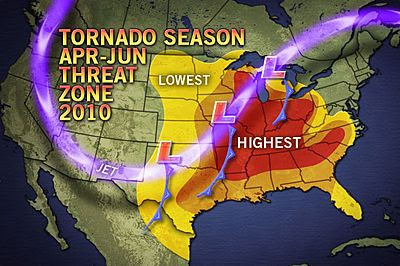 The graphic above recaps the severe weather reports for the nation on 2/24/10. Most reports from the immediate area were of the high wind and hail variety, but a few weak tornadoes also touched down in the Mid-South. A report issued by NWS-Memphis highlights three of the tornadoes (two EF-1's and an EF-0), as well as lists all storm reports received on the 24th. The list is lengthy. * A single supercell was responsible for multiple tornadoes that left damage across the state of Mississippi from west to east, from Louisiana to Alabama. 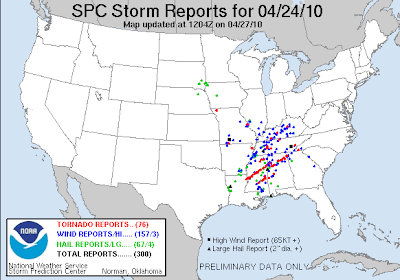 * Preliminary storm reports (as of 4/27/10) indicate that there were 76 tornadoes, 157 wind reports, and 67 hail reports on April 24. 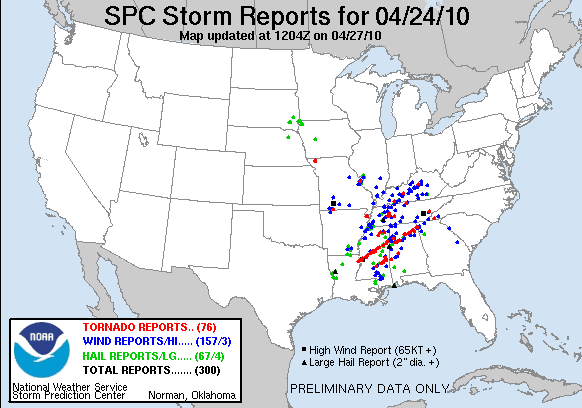 A full 50%, or 38, of the tornado reports come from MS (see graphic at top - note the line of red dots across MS indicating tornado reports from the single supercell). * The initial damage survey from Yazoo City by the NWS in Jackson indicates a monster storm: an EF-4 with 170 mph wind, 1.75 miles in width at its maximum, and a path length of at least 149 miles across central Mississippi! Embedded below is video of some of the damage near Yazoo City. You will also find a link to video of the tornado, as captured by storm chasers, near the end of this article. Next is an image of the Doppler velocity (or wind) data from the Jackson/Brandon, MS radar as the storm tore through the southeast side of Yazoo City. The very bright blues (inbound wind towards the radar at lower left) and browns (outbound wind away from the radar) right next to each other indicate very tight circulation and the position of the huge tornado. More Doppler radar imagery, including loops, can be found here. Finally, the satellite image below shows the damage path (yes, it can be seen from space) of the storm. 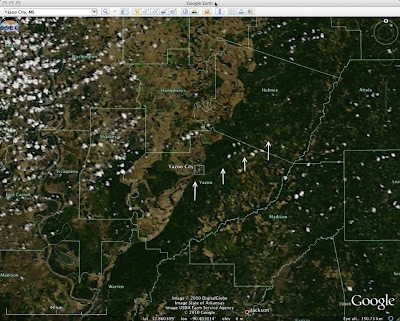 You have to look closely (here is a full-resolution unaltered version or click the image below to enlarge), but you will see a "scar" mark extending from left to right (west-southwest to east-northeast) just below Yazoo City and to the right (east) of Yazoo City, marked by white arrows. Amazing! Certainly, MemphisWeather.net will keep the people of central Mississippi and all other locations affected by severe weather the past couple of days, in our thoughts and prayers and asks you to do the same. 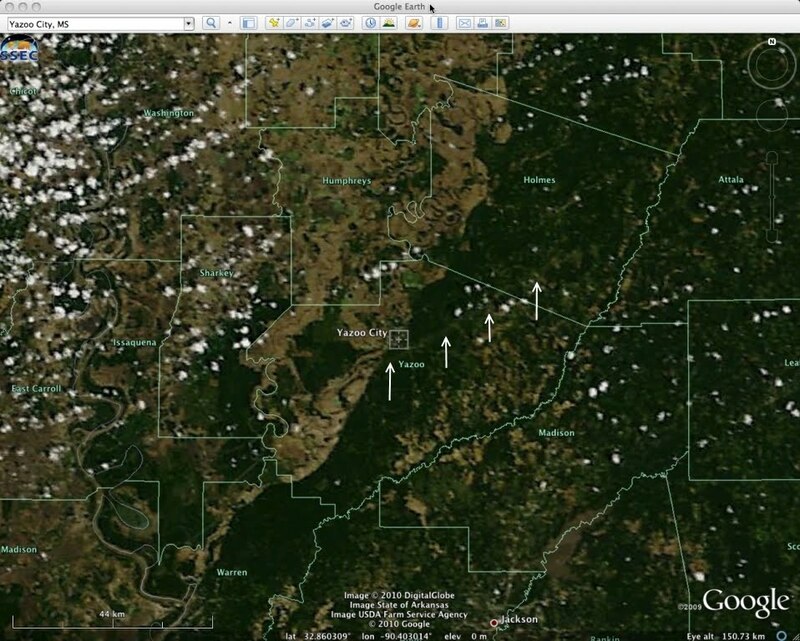 It is a miracle that the Mississippi supercell did not do more damage and that there were not more fatalities. It could have been so much worse and is definitely a storm that will live on in Mississippi weather lore. The Storm Prediction Center, the experts in severe weather forecasting, have issued a rare HIGH RISK of severe weather for much of MS and northern and central AL (just south of the Memphis metro) and a very large MODERATE RISK area that encompasses portions of 8 states, includes Memphis. The last time I recall a high risk day was Super Tuesday. Seethe top graphic above for the risk areas. SPC warns that violent, long-track tornadoes are possible in long-lived, cyclic supercells on Saturday, especially in the high risk area, but the tornado and damaging thunderstorm probabilities are elevated throughout the moderate risk area. The second graphic above depicts the probability of a tornado within 25 miles of any point, peaking at 30% within the high risk area. The risk for Memphis is not far from 30% and includes a 10% probability of an EF-2 or greater within 25 miles (hatched area in graphic). The lower two graphics are the chance of a damaging wind event (45% for Memphis) and hail 1" or larger (30% for Memphis). This event will begin to unfold shortly after dawn, with the strongest storms during the morning through early afternoon (8am-1pm). This situation is not to be casually brushed aside. All Mid-Southerners should have a plan and be ready to exercise it should they need to take cover with little warning. I fully expect tornado sirens to sound at some point somewhere in the 6-county metro area during this event. Super Tuesday is a reminder that highly populated areas are not immune from very severe weather. Stay tuned to NOAA Weather Radio and commercial TV or radio, keep a watchful eye to the sky, and stay with MemphisWeather.net for the latest on this evolving weather situation. Be prepared, not scared. Get the latest on severe weather and much more by checking out MemphisWeather.net on Facebook and Twitter! EFFECTIVE THIS FRIDAY NIGHT AND SATURDAY MORNING FROM 650 PM UNTIL 300 AM CDT. Get the latest severe weather information and much more by checking out MemphisWeather.net on Facebook and Twitter! The Mid-South remains under the threat of the most significant severe weather event since the Super Tuesday tornado outbreak. As of 1pm, little has changed with respect to the potential for severe weather over the next 24 hours or so, other than a slight increase in the confidence factor as models start to latch onto a more unified solution. The Storm Prediction Center has placed the metro region under a Moderate Risk of severe weather for both this afternoon/tonight and tomorrow and has just issued Tornado Watch #80 until 8pm, which includes metropolitan Memphis. The first round of severe thunderstorms is expected to begin by late afternoon and last into the evening hours, concluding most likely by midnight. Today's weather is driven by a strong upper-level shortwave that will be moving from northeast Louisiana very nearly up the Mississippi River. The primary concerns today are large hail, damaging wind, and the threat of tornadoes. The graphics above show the risk area for today and tonight, as well as the probability of a tornado within 25 miles of any point. For the metro area, that threat sits at about 15%. The second round of storms will start shortly after daybreak Saturday and continue in the metro area through sometime in the early afternoon hours. The period of most concern is between 9am-1pm. This round is the more potent system and will be capable of all modes of severe weather, including strong tornadoes (EF2+), very large hail (golf ball-sized or larger), and damaging wind of 60-80 mph. These storms will be driven by a developing surface low pressure that will take a similar track to Friday's upper-level system, dragging a cold front through the area. The exact track of Saturday's low pressure will determine those areas most likely to get severe weather, including the risk of significant tornadoes. Areas just to the east of the low will be under the gun, while areas just to the west could see significant rainfall and flooding concerns. A Flash Flood Watch is in effect for Saturday. Mid-Southerners should complete preparations for the possibility of severe weather, including checking their NOAA Weather Radio and talking with family about what to do should severe weather strike. Know where to go and what to do. Severe weather safety tips from MWN can be found here. The threat is not to be taken lightly. Be prepared, not scared. Get the latest severe weather updates and much more by checking out MemphisWeather.net on Facebook and Twitter! A potentially significant severe weather outbreak is setting up for the Lower Mississippi Valley into the Tennessee Valley, including the Mid-South. A combination of factors, including extreme wind shear, abundant moisture, and necessary atmospheric lifting will all come together to create ideal conditions for the development of severe weather across the Mid-South. The event will likely unfold during two periods - one on Friday evening and the other Saturday morning and early afternoon. On Friday afternoon, scattered thunderstorms are expected to form to our southwest over northern LA and southern AR, as well as the ArkLaTex region. These storms could quickly become severe as they go supercellular. The storms will move rapidly northeast and are expected to mainly affect areas near and west of the Mississippi River, with a few expected in the metro, sometime after 4pm and lasting through the evening until after dark (see graphic above). The main threats are large hail and damaging wind, though a few tornadoes are possible with these storms. In fact, the Storm Prediction Center has included areas just to our southwest under a Moderate Risk of severe weather tomorrow, while the metro area is under a Slight Risk (see SPC graphic at top). There will likely be a break in the action early Saturday morning before the next, potentially more concerning, wave of severe weather hits. A low pressure system is expected to develop to our south and move across eastern AR during the morning and early afternoon hours as it gains strength, driven by very strong jet stream (see NWS graphic above). As it does, storms will quickly develop and become severe in areas near and east of the Mississippi River, including the metropolitan region. The timing of this severe weather episode is expected to be from early Saturday (after 7am) through early afternoon. Currently, the Mid-South is under a Slight Risk of severe storms for Saturday, but I fully expect that to be upgraded to a Moderate Risk tomorrow. There is the potential for these storms to produce very large hail, damaging wind, and tornadoes - some possibly strong and long-lived. In addition, flash flooding will be an issue as rain amounts could be upwards of 2-3", locally higher, during the day Saturday. Now is the time to review your severe weather safety plan. The most important tool during a severe weather event is a method of getting current information. The best way is via NOAA Weather Radio - make sure it works and is programmed (if applicable) and has good batteries, or get one if you don't have one. Other great sources of information are local media outlets (TV and radio), as well as MemphisWeather.net. Excellent severe weather safety information can be found here. Tornado tips, courtesy of West Tennessee Weather Online, are listed below. MemphisWeather.net will continue to update you with the latest information. More frequent updates will be posted on Facebook and Twitter as the event unfolds. 1. IN HOMES OR SMALL BUILDINGS, GO TO THE BASEMENT OR TO AN INTERIOR ROOM, SUCH AS A CLOSET OR BATHROOM, ON THE LOWEST LEVEL. GET UNDER SOMETHING STURDY SUCH AS A HEAVY TABLE OR A BED. 2. IN MOBILE HOMES AND VEHICLES, ABANDON THEM AND GO TO A STURDY STRUCTURE. IF THERE IS NO SUCH STRUCTURE NEARBY, LIE FLAT IN A DITCH, RAVINE, GULLY, CULVERT OR LOW SPOT WITH YOUR ARMS AND HANDS SHIELDING YOUR HEAD. 3. IN LARGE BUILDINGS, SUCH AS SCHOOLS, FACTORIES, HOSPITALS, NURSING HOMES AND SHOPPING CENTERS, GO TO THE PREDESIGNATED SHELTER AREA. INTERIOR HALLWAYS ON THE LOWEST FLOOR ARE USUALLY BEST. STAY AWAY FROM ROOMS THAT ARE LARGE IN AREA BECAUSE THEY HAVE WEAKLY SUPPORTED ROOFS. 4. IN HIGH-RISE BUILDINGS, GO TO AN INTERIOR SMALL ROOM OR HALLWAY. 5. STAY AWAY FROM WINDOWS. DON'T BOTHER OPENING OR CLOSING THEM. IT WON'T MAKE ANY DIFFERENCE TO THE STRUCTURE AND YOU'LL JUST WASTE TIME OR PUT YOURSELF AT RISK SHOULD GLASS BREAK AS YOU ARE NEAR. A COMPLEX WEATHER SITUATION IS UNFOLDING FOR FRIDAY AND SATURDAY. LATE FRIDAY AFTERNOON AND PERSIST THROUGH LATE FRIDAY EVENING. FRIDAY...AND FROM 10 AM TO 7 PM SATURDAY. THE DIFFERENCE BETWEEN A WATCH AND A WARNING. It's been quite a while since I posted anything about our current or forecast weather - mainly because there's been so little to "write home about!" Spring is definitely in the air (literally, if you check the pollen counts) and the Mid-South has had a pretty nice stretch of decent weather. Outside of a few showers yesterday morning, and a relatively warm period last week, it's been status quo, minus one typical spring ingredient - severe weather. That "necessary" spring occurrence looks like it is on the horizon though as we head towards the weekend. A very potent weather system will be developing this week over the Plains, bringing the threat of severe weather to the southern Plains late in the week and then into the lower Mississippi Valley (and Mid-South) by early this weekend. The graphic below from the Storm Prediction Center highlights the areas of concern Friday (Day 4) and Saturday (Day 5). Strong wording is already being used by the local NWS meteorologists, indicating that this "looks like a long duration (perhaps 18 hours long) potentially significant severe weather outbreak with all types of severe weather in play" and that environmental parameters are "particularly concerning for tornadoes." The expected severe weather timing as of this writing is late Friday night and all day Saturday, with perhaps multiple rounds of storms that could also pose a flash flooding threat. 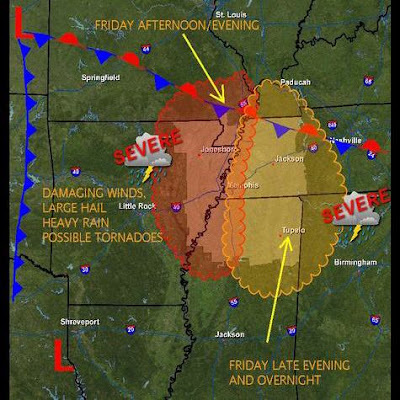 As the weekend draws closer, MemphisWeather.net and the MWN Blog will continue to keep you updated on the severe weather potential and timing. Now is a good time to make sure you have a NOAA Weather Radio ready, with fresh batteries, and bookmark MemphisWeather.net for the latest severe weather information. By following MWN on Facebook and/or Twitter, you will be able to receive even more rapid updates regarding the severe weather threat. A new generation of weather-watching satellites comes online in an official capacity tomorrow, April 14, 2010 at 2:34pm CDT. At that time, GOES-13 (GOES-N when originally launched in May 2006) will replace GOES-12 as the operational satellite covering the eastern portion of the United States and Northern Hemisphere. It will frequently be referred to simply as GOES-East. The satellite will maintain a vigilant watch from an altitude of 22,240 statute miles at 75 degrees west longitude, beaming back images every 15 minutes around the clock. It's expected lifespan is 10 years or more. The current satellite, GOES-12, will move to a position at 60 degrees west in which it can cover South America following the decommissioning of GOES-10, which had that duty until December 2009. GOES-13 is the first of three third-generation NOAA satellites (GOES N-P) to go into full operation. GOES-O (-14) and -P are in orbit in standby mode (GOES-P having just arrived in orbit in the past month). 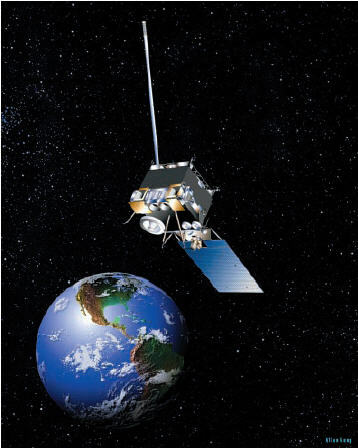 The GOES satellites (which stands for Geostationary Operational Environmental Satellite) provide meteorologists and reseachers with a vital tool in monitoring weather conditions and tracking severe storms. They maintain a geosynchronous orbit - staying in the same position over the earth at all times. The next generation of GOES satellites, the highly-anticipated GOES-R series, will carry even more advanced technology than the current satellites, including much higher spatial and temporal resolution and realtime lightning mapping. The first is scheduled to be launched aboard a Delta IV rocket in 2015. THE MEMPHIS AND SHELBY COUNTY HEALTH DEPARTMENT HAS ISSUED A CODE ORANGE OZONE FORECAST EFFECTIVE FOR SHELBY COUNTY TENNESSEE... CRITTENDEN COUNTY ARKANSAS... AND DESOTO COUNTY MISSISSIPPI... INCLUDING THE CITY OF MEMPHIS FOR TUESDAY. THIS OZONE FORECAST IS DUE TO FORECASTED OZONE VALUES THAT WILL BE UNHEALTHY FOR SENSITIVE GROUPS. THESE VALUES WILL EXCEED THE ENVIRONMENTAL PROTECTION AGENCYS FEDERAL SAFE HEALTH STANDARD. THE MEMPHIS AND SHELBY COUNTY HEALTH DEPARTMENT RECOMMENDS THAT SENSITIVE GROUPS WHICH INCLUDE ACTIVE CHILDREN AND ADULTS... AND PEOPLE WITH RESPIRATORY DISEASE... SUCH AS ASTHMA... LIMIT PROLONGED OUTDOOR EXERTION. PLEASE CONTINUE TO CHECK THE LATEST AIR QUALITY FORECASTS AND UPDATES UNTIL MONITORED VALUES RETURN TO SAFE LEVELS. FOR MORE INFORMATION GO TO WWW.SHELBYCOUNTYTN.GOV. Additional information regarding this alert can be found at AirNow.gov, as well as from the Memphis/Shelby County Health Department - Pollution Control Division. Air quality forecasts are also available daily at MemphisWeather.net. A medical helicopter operated by Hospital Wing, based in Memphis, TN, crashed into a wheat field outside Brownsville, TN at approximately 6:00am Thursday morning in the midst of a thunderstorm. WMC-TV reports that the chopper was returning to its Brownsville base a couple of miles from the crash scene after transporting a patient from Parsons, TN to Jackson-Madison County General Hospital (JMCGH) in Jackson, TN (approximated flight path shown in the graphics above). 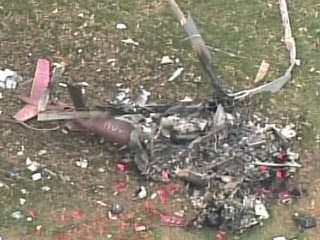 There were no patients onboard, however the three crew members - a pilot and two flight nurses - were killed. The chopper, a Eurocraft Astar AS350B3, was one of the newest in the company's fleet. The company's website indicates each is outfitted with XM satellite weather. According to WMC, another medical transport helicopter company refused the transfer due to the weather conditions before Hospital Wing transported the patient. Quoting WMC: "Improving the safety of emergency medical services flights has been on the NTSB's 'most wanted improvements' list since 2008, a year when the industry suffered a record number of fatalities." This is the first accident for Hospital Wing in it's 23-year history. The radar image above is from the Memphis (Millington) Doppler Radar operated by the National Weather Service and taken at 6:00am. The location of Brownsville is noted. A line of thunderstorms can be seen roughly over the crash site at the time of the accident. Witnesses nearby reported seeing "a large burst of lightning, followed by an orange glow in the area of the crash," according to the Haywood County Sheriff. The line passed over Memphis International Airport about 5:15am and produced heavy rain, thunder and lightning, reduced visibility to 1.25 miles, a few clouds at 900 feet with the main deck of clouds at 2,000' above ground level, and nearly 0.20" of rain in less than 10 minutes. When it passed over Jackson-McKellar airport (about 20nm east of the accident site) at about 6:15am, it produced similar conditions: heavy rain, thunder and lightning, reduced visibility to 2.5 miles, a few clouds at 900 feet with the main deck at 1,800', and about the same amount of rain in a brief period. Wind gusts at both locations peaked just below 20 knots, or 23 mph. Observations from personal weather stations in the area from Memphis to Humboldt recorded similar conditions to the two main airports. In Henning, TN (approximately 20 miles west of the accident site), heavy rain was noted at 6am. In Humboldt, TN (approximately 25 miles northeast of the accident site), wind gusted to 26 mph just before 6:30am and heavy rain was reported. There were no Severe Thunderstorm Warnings in effect. However, a Significant Weather Advisory was issued for counties just southwest of the accident site, including all of the Memphis metro area, at 5:09am for the possibility of very heavy rain, pea-sized hail, and 40 mph wind with the line. The line was moving northeast at 60 mph according to the NWS. 4/12/2010: The preliminary NTSB report on this crash was released today. Initial indications are that the aircraft was "destroyed when it impacted terrain" at 6:00am, 2.5 miles from its base at the Haywood County EMS Heliport in Brownsville. The helicopter departed JMCGH at 5:51am for the short flight to Brownsville. According to phone records between a company pilot just coming on duty and the flying pilot and a flight nurse, the flying pilot knew of the impending bad weather and was apparently attempting the "beat the storm." The meteorological analysis from the NTSB is consistent with that which was previously reported in this posting. Though there were reports of lightning and thunder at the time of the crash, there was no evidence found to support a lightning strike to the aircraft itself. MemphisWeather.net wishes to express our condolences to the families of those lost in this tragic accident and asks you to keep them in your thoughts and prayers during this most difficult time. Images above courtesy Weather Underground, Google and WMC-TV 5. 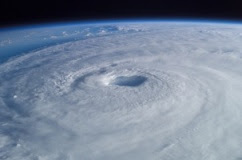 Earlier this week, Dr.'s Klotzbach and Gray of Colorado State University issued the April update to their 2010 hurricane season forecast. This forecast has been produced for 27 years and is one of the "standards" referenced in long-term tropical forecasting for the Atlantic basin. First, a review of the 2009 season (graphic courtesy NHC below). 2009 was a below-average year with just 9 named storms, 3 hurricanes, and 2 major hurricanes. The long-term average is 9.6 named storms, 5.9 hurricanes, and 2.3 major hurricanes. Only Tropical Storm Claudette (in August) and Hurricane Ida (in November) had significant impacts on the continental U.S., while Hurricane Bill paralleled the eastern seaboard, bringing only high surf and some coastal erosion (though it did impact the Canadian Maritimes as a strong tropical storm). So what about 2010? The CSU experts expect that 2010 will definitely not be another 2009. In fact, they say 2010 will have "significantly more activity than the average 1950-2010 season." With El Nino weakening and expected to be neutral by early in hurricane season, anomalously high sea surface temperatures already showing up in the hurricane-generating waters of the Atlantic, and weaker trade winds that would inject dry air into eastern Atlantic storms as they form, it is expected to be a much different year than last. Their latest prediction is for 15 named storms (56% above average), 8 hurricanes (36% above average), and 4 major hurricanes (average is 2.3). They go on to predict the probabilities of a major hurricane (category 3 or higher) making landfall on a U.S. coastline at 69% (130% of the long-term average) and a 58% chance of a major hurricane striking the Caribbean (average is 42%). Citing similar conditions, a slightly more dire forecast was made yesterday by Accuweather Hurricane Forecaster Joe Bastardi, who predicted 7 landfalls, 5 of which would be hurricanes and 2-3 of which would be major hurricanes. Changes instituted by the National Hurricane Center for 2010 include additional lead time for watches and warnings to be issued (adding 12 hours to each - 48 hours in advance of landfall for a watch and 36 hours in advance for a warning), as well as adjusting the Saffir-Simpson scale to categorize a storm based on sustained wind speed only. A slight risk of severe weather continues today for all of the metro area and broader Mid-South region. A cold front will approach from the west this afternoon. Combined with ample and increasing moisture, strong winds at the surface and aloft, and a pocket of cold air overhead, it will trigger scattered thunderstorms this afternoon as the airmass destabilizes, then a likely squall line of strong to severe storms early this evening. The main severe weather threats will be damaging straight-line winds in excess of 60 mph and quarter-sized or larger hail. An isolated tornado cannot be ruled out. The timing for any severe weather is expected to be between 4-9pm in the Memphis metro area - earlier to the west and later to the east - though rain showers and "general" thunderstorms are possible beginning in the early afternoon. Rain should move out fairly quickly as the cold front passes between 9-11pm tonight. AS A COLD FRONT MOVES INTO WESTERN ARKANSAS ON WEDNESDAY, SHOWERS AND THUNDERSTORMS WILL BEGIN TO MOVE INTO THE AREA. THERE IS A SLIGHT RISK OF SEVERE WEATHER FOR WEDNESDAY AND WEDNESDAY NIGHT. THE MAIN THREAT WITH THESE STORMS WILL BE LARGE HAIL AND DAMAGING WINDS, WITH ISOLATED TORNADOES POSSIBLE. THE COLD FRONT WILL MOVE THROUGH WEDNESDAY NIGHT. Now would be a great time to sign up to receive severe weather watches and warnings by e-mail from MemphisWeather.net - for FREE! Visit our Weather Alert Notification Services page and select your county or follow @shelbyalerts on Twitter for Shelby County watches and warnings. MWN will stay on top of the situation and keep you informed as conditions dictate. March is typically a difficult month to forecast as large temperature and moisture swings are possible over a short time period and a miscalculation in the timing of a frontal passage by just a few hours can introduce significant error in temperature and dewpoint forecasts. MWN managed to keep these significant errors to a minimum in March and by the smallest of margins bested the computer model forecasts with respect to high and low temperature forecasts for the month. For the month, the average temperature error in all MWN forecasts was 1.71 degrees, or 0.01 degrees better than the Global Forecast System (GFS) model, taking first in the temperature category. For dewpoint accuracy, the MWN forecast was also the best of the data sources at 2.81 degrees average error, again beating the GFS by only 0.03 degrees. More detailed accuracy statistics can be found here. After a very cold winter season, March saw just slightly below normal temperatures. At Memphis Int'l Airport, the average temperature for March was 52.6 degrees, which was 0.9 degrees below normal. As one might expect for March, the was a large range between the highest and lowest temperatures of the month. The maximum temperature for March was 79 degrees on the 31st and the lowest was 27 on the 4th. There were 4 days that the temperature dropped below freezing for the month, though no temperature records were set in March. March was a fairly dry month as well with precipitation well below normal for the month. The airport recorded 3.62" of precipitation, which was 1.96" below normal. There were 10 days on which measurable precipitation fell, with a maximum of 1.10" on the 11th. The peak wind gust was 56 mph, also recorded on the 11th. Hail was reported in thunderstorms on the 11th and 25th. Click here for the NWS climate recap for March. The average temperature for March at the WXLIVE! station in north Bartlett was 51.5 degrees, about one degree cooler than the airport, with a maximum of 80.3 on the 31st and a minimum of 21.4 degrees on the 4th. March precipitation totaled 3.93" at the automated WXLIVE! gauge, while a co-located manual gauge used for the CoCoRaHS program measured 3.82". There were 12 days with measurable precipitation, with a 24-hour maximum of 0.97" on the 21st. The peak wind gust was 32 mph on the 25th. Click here for a daily statistical recap on MemphisWeather.net. For all MemphisWeather.net Mobile users out there, I thought I'd give you a sneak peek of Cirrus Weather Solutions' next big product upgrade: StormView Mobile Radar. StormView Mobile Radar is an upgraded radar display designed specifically for use on mobile platforms like iPhones and Blackberrys, or devices that use Symbian, Android, Windows Mobile, etc. and will look similar to the web version of StormView Radar. The screenshots below show the radar in action in Dallas, TX on Friday morning as storms rolled through the area. We expect to offer both regional and metro views, as a still image and an animated loop. Leave a comment and let us know what you think! 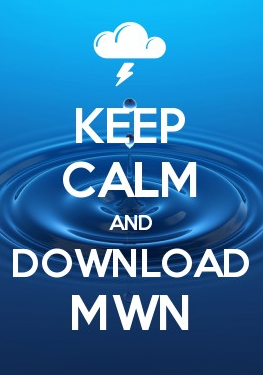 Our goal is to continue to keep MWN Mobile an ad-free experience. If you or your business are interested in becoming a sponsor for StormView Mobile Radar and helping to underwrite the cost of the product, contact Erik at Cirrus Weather Solutions. Or for more information on sponsorships, click here. Thank you! With all of the Easter-related activities in store from this weekend, including egg hunts, sunrise services, family gatherings, and more, you're probably wondering whether the rain and thunderstorms you have been hearing about will affect your plans. Look no further - MWN has your answer! Starting with today, another very warm and breezy day is in store as highs again top out near 80. A veil of high clouds will filter the sunshine and perhaps keep temps a degree or two below yesterday's readings, but it will be dry and pleasant throughout the day. Gusty wind could reach 30 mph this afternoon ahead of the next storm system. Look for evening temperatures to remain in the 70s with dry conditions continuing. That next storm system will enter the Mid-South tonight, accompanied by what I expect to be a weakening line of storms. Some areas of Arkansas could see some severe weather, including damaging wind and an isolated tornado, but with the line entering the metro area after midnight, much of it's power will be on the decline. So look for rain, possibly heavy, after midnight with some thunderstorms containing wind gusts in the 40-50 mph range. Fortunately, it appears that most of the strongest storms and heaviest rain will be moving east of the area by sun-up on Saturday, though some lingering showers are possible until 9-10am. After that, look for the sun to begin to break out by late morning and partly cloudy skies for the afternoon. Temperatures will rise from a low near 60 to the mid 70s in the afternoon. Saturday night and Easter Sunday will be pleasantly warm with a good deal of sunshine on Sunday. Sunrise services on Easter morning will have temperatures in the 50-55 degree range with an afternoon high back in the lower 80s! The warm weather pattern sticks around through the first part of next week, though it will be a little more muggy than the past few days. Highs will be in the 80-84 range with lows in the 60s Monday and Tuesday before the next frontal system arrives mid-week. For the latest forecast information, visit the MWN Forecast page. More tornadoes than normal this spring? A couple of recent blog posts by Jesse Ferrell of Weather Underground and Paul Yeager of AOLNews and CloudyandCool.com have discussed the expected uptick in severe weather, specifically tornadoes, as we head into the heart of spring when cool, dry air collides with warm, moist air. Though the first three months of the year have been decidedly weak statistically (tell that to the folks in North Carolina and elsewhere where tornadoes have occurred in 2010), both expect that to change in April and May. The lower than average tornado count so far could be a factor of the El Nino pattern, which has brought cooler than normal conditions to typically tornado prone areas so far in 2010, among other things. Though the spring months are typically active for severe weather, both bloggers mention the likelihood of the waning El Nino pattern as a factor in the likelihood of increased severe weather and tornadoes as spring turns to early summer. 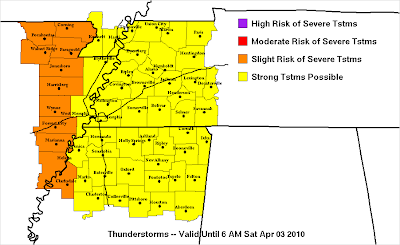 In fact, Accuweather has issued a "Tornado Season 2010" forecast, which Ferrell discussed in his blog, that indicates a heightened risk of the most severe of storms for the Mid-South region. The graphical portion of the forecast is shown below and was created by Accuweather meteorologists. It depicts the expected storm track and areas where a heightened risk is forecast, which includes the Ohio Valley, Midwest, Mid-South, and interior southeast states. We'll certainly keep an eye out for severe weather possibilities at MemphisWeather.net and let you know when the threat is elevated via the website, this blog, Facebook, and Twitter. [Weather Whys will] appeal to folks across the spectrum – from the seasoned weather professional, to the weather enthusiast, to one with even a passing interest in the weather. [Yeager's] folksy story-telling tone, a broad knowledge in an array of atmospheric topics, and the ability to explain complex processes in a way that an average middle school student could understand, have come together in Weather Whys to produce a text that is not only information and educational, but entertaining from cover to cover. You can find a nice discount on the book on Amazon by clicking here.